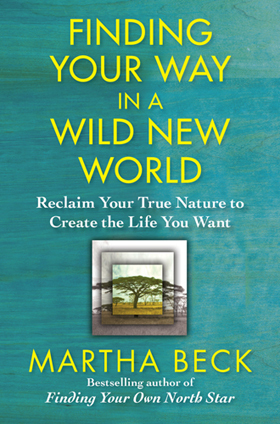 Excerpted from Finding Your Way in a Wild New World, Reclaiming Your True Nature by Martha Beck, published by Free Press. Very few people realize how powerfully we influence others when we’re logged on to Oneness. I don’t understand it myself, but sometimes I get a hint. It helps a great deal to live in energetic connection generated by my Wordless son. For example, one evening while communing with nature during a desert sunset walk with my dogs, it occurs to me that it’s easy to feel Oneness in such ideal conditions. I wonder if I could work this technology of magic in a less idyllic setting. A perfect opportunity to try presents itself immediately: I’m scheduled to take Adam and his friend Joey, who also has Down syndrome, to a Phoenix Suns basketball game. An NBA game isn’t exactly a silent grotto where monks might go to find stillness. The arena is packed with screaming fans, flashing lights, deafening music, spilled beer. Manic cheerleaders are shooting a “gift cannon” at the audience, and Adam and Joey (who are fifteen years old physically but cognitively about eight) reach for every souvenir as it soars over their heads. Adam wants a Shaq T-shirt, and Joey wants a stuffed gorilla dressed in a Suns outfit. I watch sadly as they learn a lesson that will probably be true their whole lives: they’re too short, uncoordinated, and slow to out-grab the other fans for such prizes. This chaotic scene is just the right place to test my ability to tune in to my true nature. I settle in my seat and dropped into Wordlessness, wondering if I’ll be able to find even a shred of stillness in such an unlikely spot. It takes a minute or two, but then I manage it. At the moment verbal thought disappears, I feel flooded with unexpected, dazzling beauty. The game taking place on the basketball court becomes an incredibly graceful ballet, each team of five huge men moving like separate fingers of the same hand, the two giant hands tossing the ball back and forth in the bliss of deep play, the crowd swaying and surging like sea plants in the surf. A moment later I feel an explosion of human Oneness. Every being in the enormous space seems connected to every other. The power of that connection overwhelms all our surface differences, our sense of being many separate beings. I don’t see how the arena can handle the pressure; it seems as though the roof will blow off any moment from the force of so much love. To my great embarrassment, I feel tears on my cheeks. I wipe my face and look around to make sure no one’s watching me. That’s when I notice the crowd acting strangely. All around me, in a huge circle, I see a ripple of action, a disturbance like the rings that extend from a stone dropped into water, but in reverse: the waves are coming toward me. It takes me several seconds to realize what’s happening. From every direction, people have begun handing over the prizes they’ve snatched out of the air, passing them person-to-person in a spontaneous bucket line. They’re offering their gifts to Joey and Adam. I completely lose it, weeping openly as someone hands my son a Shaq T-shirt. Joey tries to be manly, but can’t help hugging and kissing his new Suns gorilla. I stand up and turn around with my hand on my heart, trying to Wordlessly thank at least a hundred strangers who have all been part of the full-circle bucket line. It feels as though, by dropping the illusion of separation, I’ve allowed myself to activate the loving connection inherent in all these beer-sloshing basketball fans. They responded with love as generous, gentle, and selfless as a mother tending her baby. Many of them are weeping too. Adam and Joey politely refuse the rest of the gifts, and the people around us began offering them to one another. I don’t know exactly what’s happening in that basketball arena, only that it is completely magical and utterly natural. When human beings open to the experience of Oneness, groups, crowds, whole nations may respond to single loving impulses with inconceivable power. This is the power that has made us such a successful species. It may be enough power to let us mend our own true natures and the world. The Team—of world-menders—which may include everyone on Earth—is gathering. By accessing Oneness you can join that gathering, right now, wherever you are. Copyright 2010-12 Feminist.com. All rights reserved.